Ian McKellen as himself, and Richard Harris as Dumbledore in the "Harry Potter" films. Audiences know and love Ian McKellen's portrayal of Gandalf the Grey (and later White), the bearded wizard in the "Lord of the Rings" and "Hobbit" films. But it turns out the actor could have played a hirsute magician in yet another classic film franchise: The "Harry Potter" films!Alas, he turned the role down — and the reason may surprise you, according to Today.com. "Harry Potter's" beloved Dumbledore was originally played in the franchise's first two films by Richard Harris, then by Michael Gambon for the rest of the series after Harris' death in 2002. But Harris didn't have a very high opinion of McKellen. During a recent interview on the BBC's "HARDTalk" show, interviewer Stephen Sackur recounted a quote in which Harris said McKellen and fellow actor Derek Jacobi were "technically brilliant but passionless." 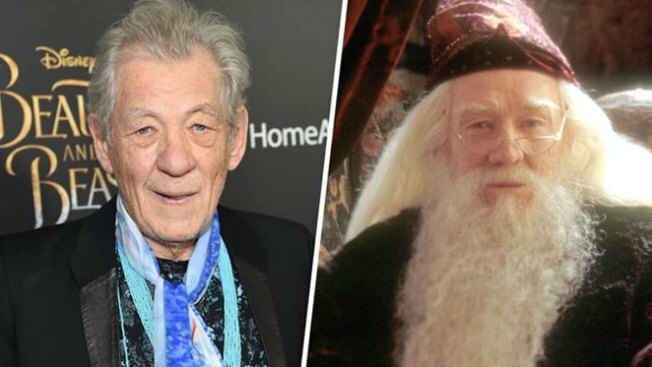 "Nonsense," McKellen said of the criticism, noting that when Harris died he had been playing Dumbledore, but then quipped, "I played the real wizard."